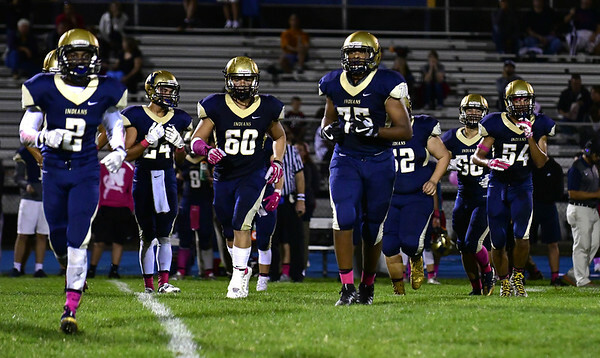 NEWINGTON - Jason Pace’s first season as the head coach for the Newington football team was a learning experience, for both the players and the entirely new coaching staff. Pace was happy with what they were able to accomplish in that first year, as the Indians transformed into a different program. And although they finished 3-7, they were able to end the year on a high note, with a 17-13 win over rival Wethersfield. Now that Newington understands Pace’s coaching style and philosophy, it needs to build. The Indians will be heading into the season with a new quarterback, plus new running backs and wide receivers. The Indians graduated 17 seniors, most of them being starters, including quarterback and leading rusher Robert Sanchez, who gained 569 yards on the ground last season. Newington will also have to replace cornerback and wide receiver Callum Cadwell, free safety and wide receiver Luke Pappalardo and running back Aveontae Frazier. The big question is who will be stepping up to fill the cleats of Sanchez. Only a sophomore, the Indians have a tremendous amount of belief and support in Pestrichello. Pestrichello will be accompanied by running back Dylan Nees-Fair and wide receivers Izayah Ciarcia and Keenan Esau. The Indians are only returning a few starters on defense as well. One of those starters is junior linebacker Julian Mulero. Mulero started every game for Newington last season, collecting 41 tackles. Mulero will have an even bigger role after middle linebacker Brandon Kamansky, who suffered a season-ending injury in Week 3 last year, was lost for this season after tearing his ACL during a preseason scrimmage. Pace is expecting his team to make mistakes early on, but he is also expecting his team to learn from those mistakes and grow. Posted in New Britain Herald, Newington on Wednesday, 5 September 2018 21:12. Updated: Wednesday, 5 September 2018 21:14.